Today's post is a special one. Camilla, one of my blogging friends is celebrating her 15th wedding anniversary today and in keeping with the fact that they had a cheesecake instead of a traditional wedding cake, invited us to celebrate with her by making a cheesecake. I jumped at the opportunity because I love cheesecake, but haven't made too many myself, apart from this Japanese Cheesecake, a yummy no-bake Strawberry Cheesecake and this Blackcurrant Cheesecake. 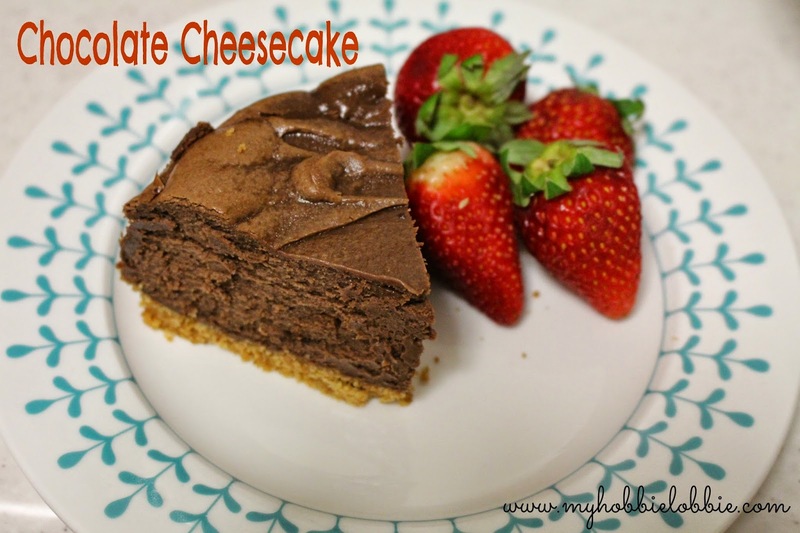 I've always wanted to try out a Chocolate Cheesecake and this seemed like the perfect time. I initially intended using a Nigella Lawson recipe, but saw that she used custard powder. I didn't have any and didn't want to buy something I'd use for just one recipe. So I looked for another recipe and I found this one. I pretty much stuck to the recipe with the exception of the base. I used some Digestive biscuits instead of the Oreo cookies. The recipe was simple to put together and full of chocolaty goodness. If you know a chocolate lover, they'd love this treat. I used a combination of milk and 70% dark chocolate and it was divine. If you prefer Milk chocolate, just use that instead. It had a beautiful silky texture and wasn't too sweet as a result of the mix of chocolate I'd used. I'm happy I tried this recipe out; it sure is a keeper. So this one is for you and your husband, Camilla - Happy Anniversary!!! Mix the biscuit crumbs and melted butter till the mixture resembles wet sand. Beat the cream cheese, sugar and vanilla till combined. Add eggs one at a time and beat between each addition till incorporated. Bake for 45-55 minutes or until the centre is almost set. Trisha, this looks absolutely divine. Thank you for sharing the recipe and helping me celebrate my 15th anniversary. Thanks for stopping by Camilla! simple and delicious- looks great! Chocolate cheesecake? Are you kidding me? YUM!!! Trisha, it looks wonderful!!! Be still my chocolate-loving heart! This looks divine! yay for chocolate cheesecake! I like darker chocolate and less sweet desserts myself. :) Thanks for stopping by Nicole! oooh this sounds delicious! I like the idea of digestives for the crust, unique! Chocolate cheesecake? Yum! Most people make a fruit version of cheesecake, but after seeing your chocolate version, I cant imagine why more people don't make it this way. I loved it for an occasional treat, but i do love the fruity versions too!